We spoke with Professor Shapo about his current work in this area. This is your third book on the topic of experimentation on an unaware public. How did you first become interested in studying this phenomenon? How has it changed over the course of your career writing about it? Early in my teaching career, much of my research focused on the law of products liability, which principally deals with suits by consumers against sellers of products that allegedly have caused injury. That research propelled me into studying how government agencies regulate safety in all kinds of areas, from automobile design to cigarettes to drugs, and medical devices to pesticides. As I studied both topics—both the law on consumer suits and the law concerning regulation of safety by government agencies—I began to recognize that all of the time we are all experimental animals for various kinds of products and activities. Sometimes we know that we are “guinea pigs,” for example when we are subjects of clinical research for which we sign consent forms. Often, however, we do not know of that role and only find out about it if a product or activity injures us. I have now developed that concept in three books, of which The Experimental Society is the most recent. Your book is full of real-life products and activities that are examples of experimentation. What are a few of the most illuminating? The range of products and activities covered in the book is broad. Much of the book deals with issues that are controversial, where there are platoons of experts lined up on both sides concerning the degrees of safety and risk associated with particular products and activities. In the area of consumer products and exposure to toxic products, these things include the enormous costs, in both suffering and dollars, that are inflicted by cigarettes and exposure to asbestos. In the area of medical treatment, they range from particular prescription drugs and devices to mammography to birth control methods. In the environment, they range from nuclear power plants and the testing of atomic bombs to oil spills, and they include fracking and the effects of global warming. Obviously this book addresses the legal ramifications of experimentation, but it goes well beyond that too. What do you hope lawyers and non-lawyers each take from it? I hope that both non-lawyers and lawyers will understand that in many areas of life, they are in fact experimental animals, in ways that not even those doing the experimenting may think of as involving experiments. All readers should understand that many of these things are part of ordinary living which do not have to be viewed as scary but which sometimes call for caution in using innovative products and participating in risky activities. The book may give lawyers—both those representing business clients and those representing injured clients—ways to create arguments on behalf of both types of clients. You’ve identified both producers and consumers as often unknowing participants in experiments, which can clearly be a problem. Are there any particular solutions you favor? I urge the collection of more data about what ordinary people know about risks that in some sense are experimental and about how they respond to information about risk. I present a brief set of guidelines for business persons and government agencies, guidelines which emphasize clear communication to the public of information about the risks, as well as the benefits, of products and activities. Recognizing that we already have a lot of government agencies dealing with health and safety, I’ve gone so far as suggesting the possibility of creating “an institutionalized Cassandra,” which would at least whisper in people’s ears to be “cautious about the prospect of experimentally caused danger.” This whispering should reach the ears of all who do experiments that may impinge on the health and safety of others, but also the ears of the public—those who are the subjects of these experiments. I raise for discussion questions about the fairness of how experimental risks are distributed between business and consumers. You discuss not just products (like drugs and food) and processes (like fracking) but also experimentation in ways of thinking, including within the law. Can you talk a bit about that? Justice Holmes once wrote that “all life is an experiment.” He might have applied this famous statement to law itself. Law is always an experiment. When courts announce new rules of law, they are experimenting, and inviting other courts to judge the justice of the rules they announce. Every time Congress enacts a new law, it is trying out that law. A classic example is the set of laws enacted in the New Deal, some of which were held constitutional and others unconstitutional. Beyond laws passed by Congress and state legislatures, whenever a governmental safety or health agency publishes a new regulation, it is experimenting. 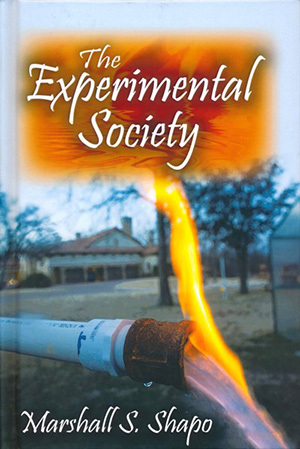 Professor Marshall Shapo’s latest book, The Experimental Society, was published earlier this year by Transaction Publishers.